Which used Audi A4 sports should I buy? The 1.8-litre turbocharged petrol model produces 161bhp, but it's no more efficient than the 197bhp 2.0 TFSI engine. The more powerful engine gives the A4 a good turn of speed - taking it from 0-60mph in 8.1 seconds. The 252bhp 3.2 V6 comes in four-wheel-drive form as standard, while the 4.2 V8 S4 is incredibly fast, but extremely thirsty. Diesel fans should choose the 138bhp 2.0 TDI, which copes well with the weight of the car. The 230bhp 3.0TDI is significantly faster, but also significantly more expensive to run. 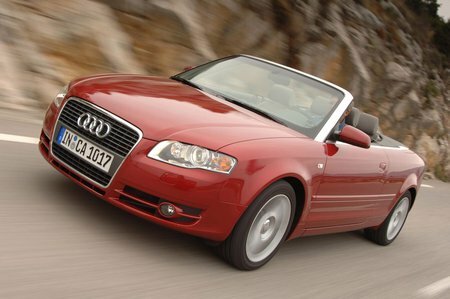 All A4 Cabriolets get plenty of kit, including an electrically powered hood, climate control, foglights, alloys and a CD player. Sport trim comes with firmer suspension, upgraded alloys and a leather-trimmed steering wheel. The high-end S Line comes with 18-inch alloys, leather upholstery, extra body and cabin trim, plus an upgraded stereo. The CVT automatic gearbox option is reasonable, but the six-speed manual gearbox is more satisfying to use - and will help get more miles to the gallon. Avoid non-metallic paint colours, because they're worth noticeably less on the used market, but try to find a car with the upgraded BOSE stereo system.